Waukesha, WI.—Coppe Laboratories, a specialized medical diagnostics company announced results from a 2-yearstudy of Wisconsin ticks and tick-borne illnesses. From fall 2013-Spring 2014, ticks were collected by the Wisconsin DNR and other individuals across the state and generously donated to Coppe Labs. Both the blacklegged deer tick (Ixodes) and the common wood tick (Dermacentor) were included in the testing for infectious agents responsible for Lyme disease, Anaplasmosis, Babesiosis and a virus known as Powassan. Over 2000 ticks were collected. Testing of the ticks determined the statewide prevalence of Borrelia infected ticks to be 11%, with about 40% of the ticks in northwestern Wisconsin demonstrating infection with this Lyme disease causing agent. Statewide prevalence of Powassan virus infected ticks was 6%. Of special note, in certain “hyper-endemic” regions of northwest Wisconsin, over half the ticks were infected with Borrelia and 11% were co-infected with Powassan. There were also a minor number of ticks with the protozoan infection Babesia. The study was conducted to determine the actual rate of ticks infected with multiple disease-causing agents. 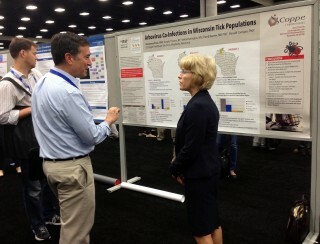 Wisconsin has the highest incidence of tick-borne diseases in the Midwest. The Northeast Region of the United States ranks highest overall. This study was presented at the Infectious Disease Society of America (IDSA) annual meeting on October 10, 2015. 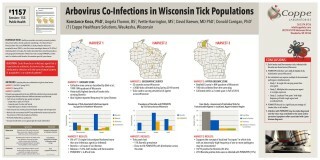 “Results of this study show that the ticks across Wisconsin have the potential for transmitting multiple infectious agents in a single bite,” said Dr. Konstance Knox, CEO of Coppe Laboratories and first author on the abstract. “The Powassan virus is an emerging tick-borne illness in the United States, but its cousin the Tick-Borne Encephalitis Virus, has long been recognized to cause significant illness in Europe.” Powassan virus can infect within 15 minutes of the tick bite. The Wisconsin Department of Health Services reports over 1700 cases of confirmed Lyme disease in 2013 and estimates that the actual number of cases is closer to 4000. It is the highest reported tick-borne disease in Wisconsin, with more than 23,000 cases reported between 1980 and 2010. The highest number of cases is seen in the north and northwestern region. According to the Coppe Labratories’ study, the ticks carrying diseases are seen in almost every county in Wisconsin. Coppe Laboratories, headquartered in Waukesha, Wisconsin, is a specialized, Clinical Laboratory Improvements Act (CLIA) certified diagnostic laboratory that provides a spectrum of laboratory tests with an emphasis on the role of infections in acute and chronic diseases. We are committed to eliminating barriers experienced by physician and patients in the diagnosis of disease through scientific research and innovative diagnostic assays. Providing physicians and their patients with accurate, high quality, and clinically relevant results in a timely fashion is their goal.